If you’re worried about not being able to hula hoop, knowing what size hula hoop to get is the best way to ensure you will be successful. Trust me, I know how confusing it is to figure out what size hula hoop you need to start. When I first started hooping, I did exactly what most people do: I bought a hoop on a whim in the toy section at Walmart, rushed home, tried it out and couldn’t get the hang of it at all. That’s when I started researching online. I felt completely overwhelmed by information about hoop weights, diameters, and even tubing sizes. I wrote this article to make it easy to figure out what size hula hoop to get, no matter what your body type or skill level. 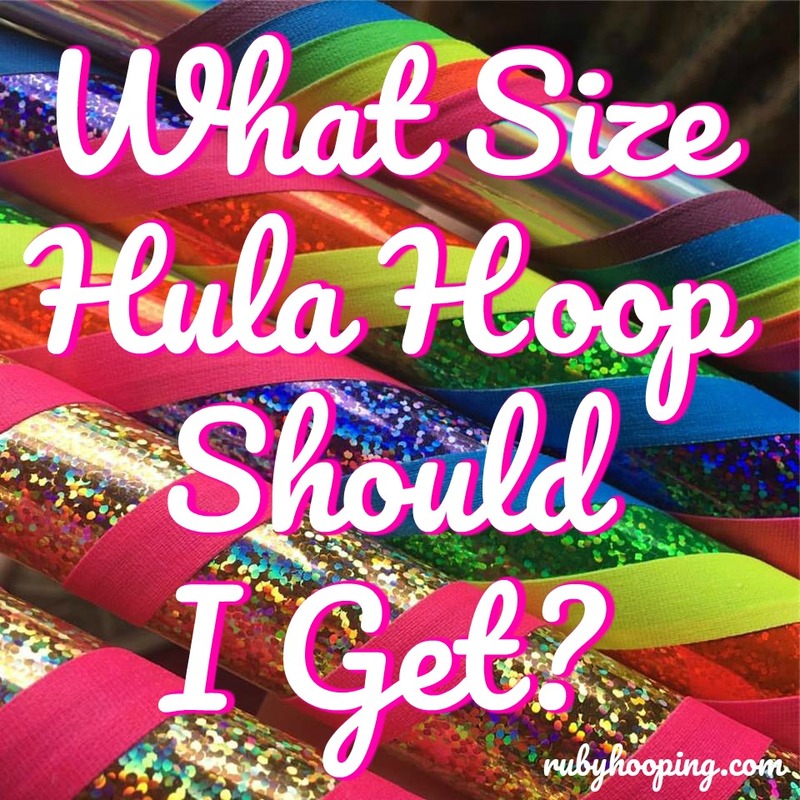 I want you to have full confidence in choosing a hoop size for your first real hula hoop. Rubyfam at Land Between the Lakes, KY, with the glow of sunset on our faces. 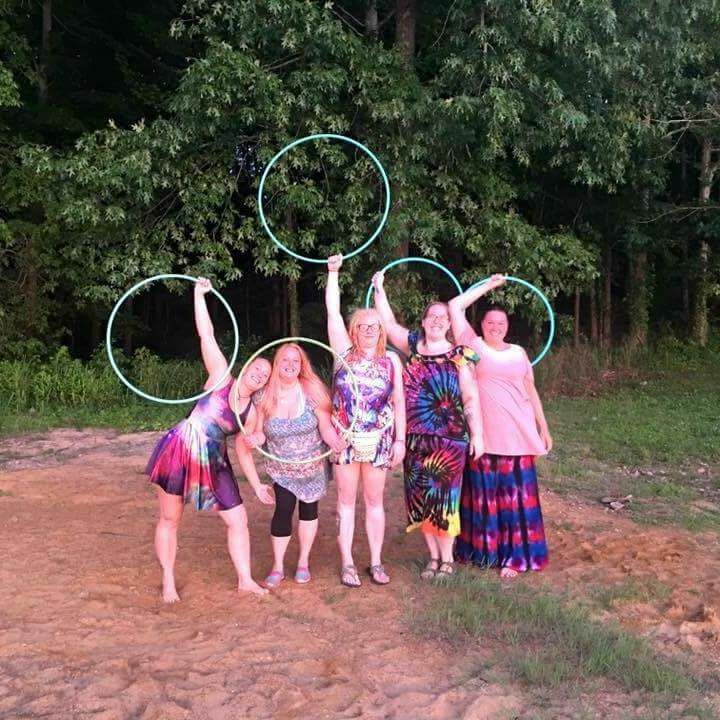 It’s so important to make you sure get the right size hoop when you’re just starting out, to ensure a positive and exciting hooping experience. When people try to learn with a hoop that is too small, they often give up too quickly, not realizing they just need a different size hoop. To make matters even more confusing, there is some misinformation out there on what size hoop to start with. Some say to choose a hoop that, when holding it out in front of you, it reaches from the floor to your belly button. This is completely arbitrary and only works if your body is fairly small. Since I happen to not be fairly small, this problem has been pretty obvious to me from the get go. Think about it like this: would two women, both 5’7″ with relatively similar belly button heights, use the same size hoop, even if one weighed 130 pounds and one weighed 250 pounds? Of course not. The space between your body and the hoop is the most important aspect of learning how to hula hoop. If the hoop is too small, it will move very fast around your waist, meaning you better boogie like you’ve never boogied before or that hoop is going south, fast. A larger hoop slows down the rotations and gives you time to actually feel the rhythm and move with the hoop. This is truly the best way to really get to know the art of hooping. Here is a video I made recently to show you how different size hoops interact with our bodies. I started off this video with a tiny 19″ mini hoop, then I use a 30″, 35″, and 44″, and finish with a 55″ 3/4″ beginner hoop. You can see that on-body hooping becomes much easier for me with the 44″ and up. That’s because I am a tall, large person. Now I will share with you a chart I’ve created. These sizes are my best recommendations based on my five years of experience helping people get fitted for their first hula hoop. I want to emphasize one thing. Remember that when it comes to starting hooping, you cannot go wrong with a bigger hoop. It’s entirely possible to get a hoop that is too small to learn on, but no hoop will ever be too big to hoop with. Beginner Hoop vs. Exercise Hoop: What’s the Difference? I know you’ve seen both of these terms thrown around and are trying to figure out if they are interchangeable or if these are two different kinds of hula hoops. The answer is that they are quite similar, but the exercise hoop is slightly heavier than the beginner hoop. Both beginner and exercise hoops are heavier than lightweight hdpe or polypro hoops, which are used primarily for dancing and tricks. 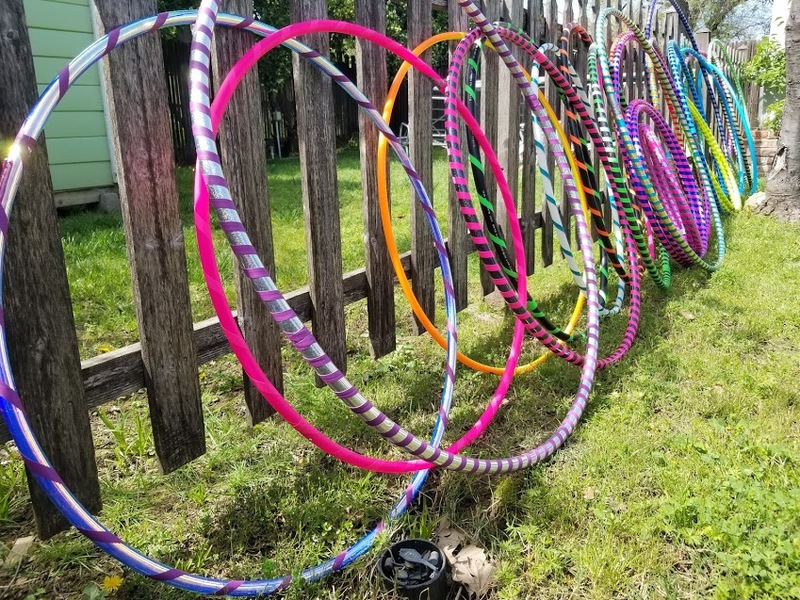 Beginner hoops are geared toward learning the basics of hooping, and you need a large diameter and moderately heavy tubing to do that. But you don’t need anything heavier than 1 pound, which is about what our beginner hoops weigh, to learn everything imaginable with a hula hoop. Exercise hoops are also somewhat heavy, about 2 pounds total, so they weigh about twice as much as a beginner hoop. These hoops are for people who are only hooping for exercise and are most interested in toning muscle. 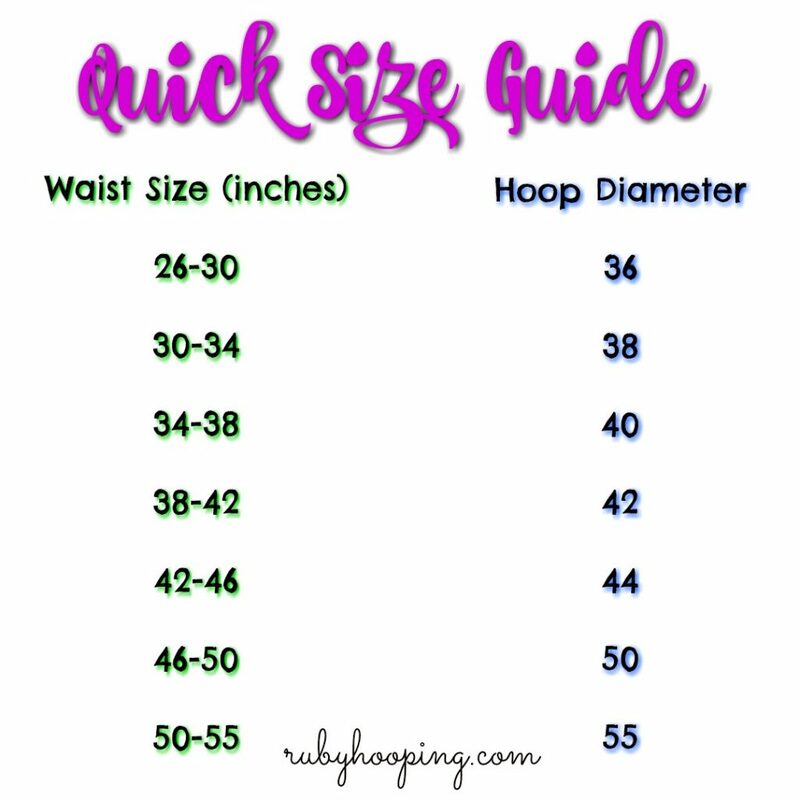 Regardless of whether you choose a beginner hoop or a weighted exercise hoop, you should go by our Quick Size Guide pictured above to choose what size hula hoop you should get. All styles of hula hooping are great exercise and burn plenty of calories, and different styles of hooping can help you focus on your goals. For example, spinning two hoops is a great workout for your arm and shoulders. Exercise hoops are particularly useful for core workouts. What Kind of Hooper Do You Want to Be? 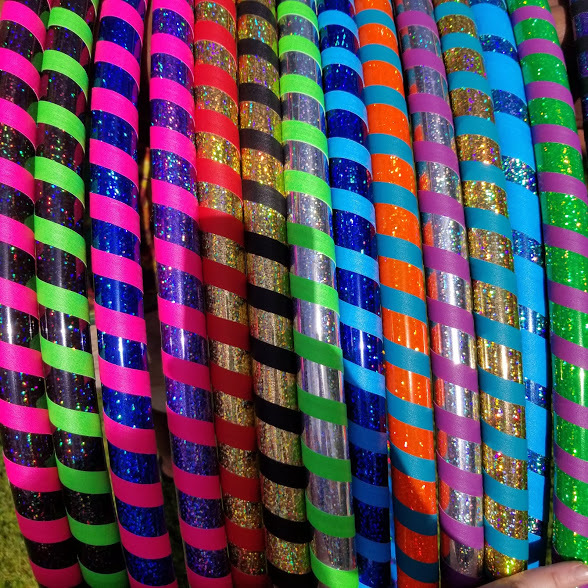 What size hula hoop you should get will vary if you are into it mainly for the dancing, tricks, and off-body moves. You don’t need a big heavy hoop if you’re not trying to spin it around your entire body. 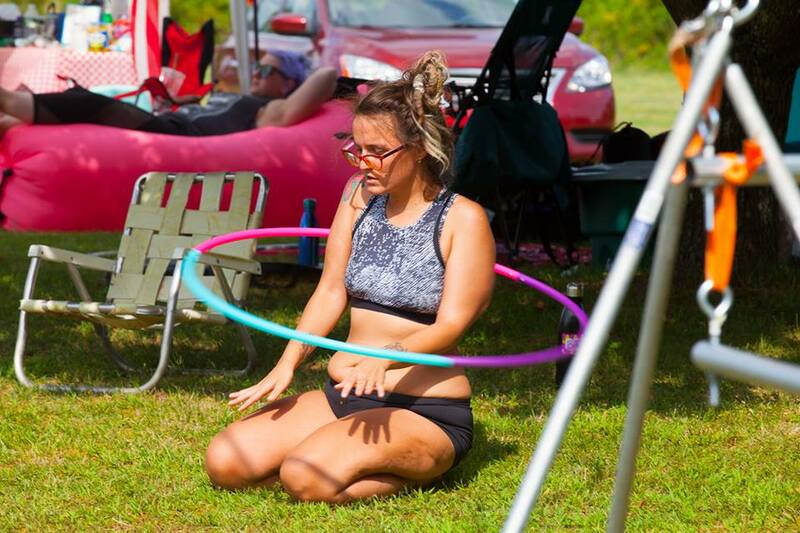 When I first started hooping, it was primarily to add another form of exercise to my weekly routine, but as soon as I started to get good at waist hooping using my big beginner hoop, I quickly became enthralled by hoop dancing. So, my second hoop was a slightly smaller diameter lightweight hdpe hula hoop. It was about 4 inches smaller in diameter than my first hoop, and made of 3/4″ tubing so it felt a little thinner in my hand. It was the perfect size to start exploring some off body tricks that were not as easy to execute on the bigger hoop. 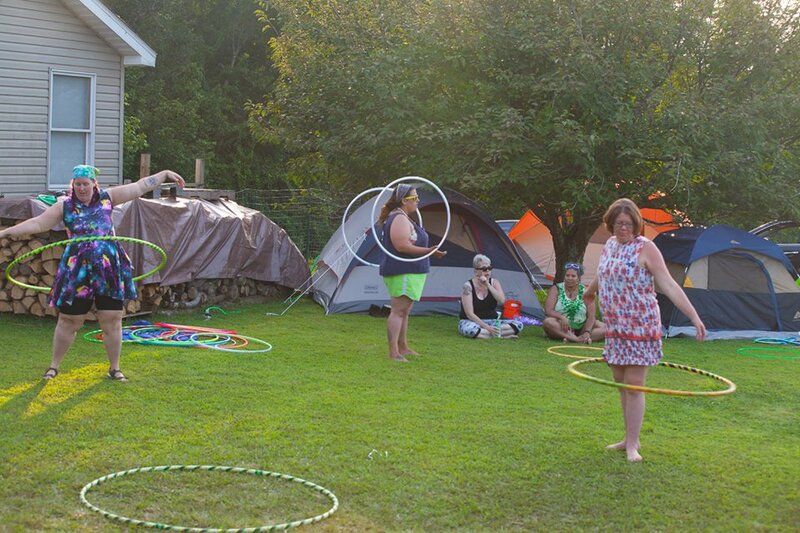 Hoop dance tip: invest in some good online hula hoop courses. Getting the proper instruction from the beginning is way better than just taking a shot in the dark looking up random tutorials on Youtube. 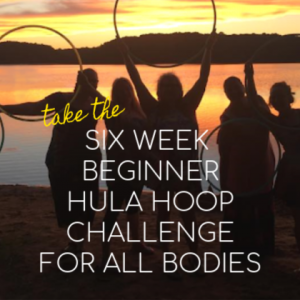 Take my Six Week Beginner Hula Hoop Challenge for All Bodies at your own pace, in the privacy of your home! So I keep seeing you talk about two types of lightweight hoops, hdpe and polypro. What’s the difference? I just want to be clear and tell you that these two types of tubing are very similar. They are both lightweight and make a great choice for hoop dance and tricks. They are both significantly lighter weight than PE tubing, which is the tubing used to make beginner and exercise hoops. The main difference between hdpe and polypro is that polypro is a bit springer so it moves a little faster. Hdpe aborbs more impact so it tends to move a little slower. 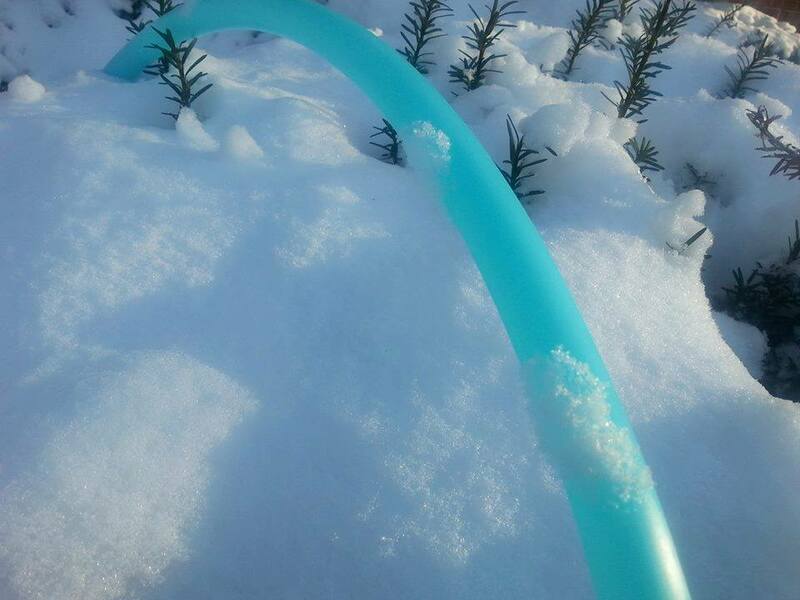 Polypro is also more likely to crack or break, especially in cold temperatures, whereas hdpe can withstand more force and is less susceptible to winter weather. For these reasons, I personally recommend hdpe over polypro for a beginner interested in hula hoop tricks and dance. Hdpe can better handle all the drops and throws that will inevitably happen when you first start. It also moves just a tad slower without the added weight of a beginner hoop, giving you the versatility you need for learning tricks and dance. Choose an hdpe hoop that is 2-4 inches smaller than your beginner hoop, and always select 3/4″ tubing. It will be thinner than your beginner hoop but still substantial enough for learning. Our Go Getter Starter Pack includes a perfectly sized hdpe hoop for your unique body. There is one more thing to consider when choosing what size hoop to get in addition to your body type. 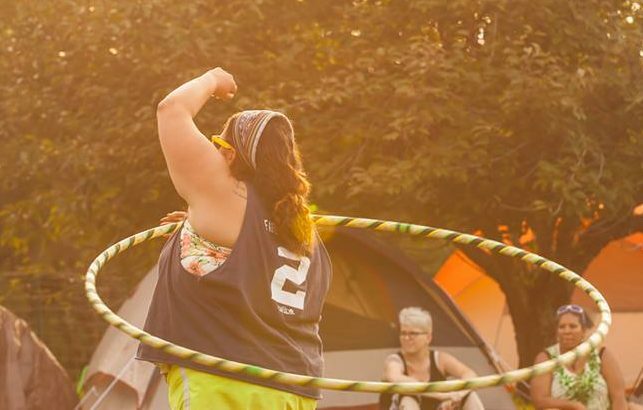 Think about why you want to hula hoop and what your goals are. Do you just want a new form of exercise added to your routine? Are you interested in hula hooping for weight loss? Do you want to learn tricks and dance? Or are you more interested in just a simple meditative hoop practice? Let’s expand on these questions a little bit. If you are mainly just interested in hooping on your body, without tricks and flashy stuff, or if you want to start hula hooping to lose weight, go by our Quick Size Guide. If you are more interested in tricks and dance, you can start with a lighter, smaller hoop. 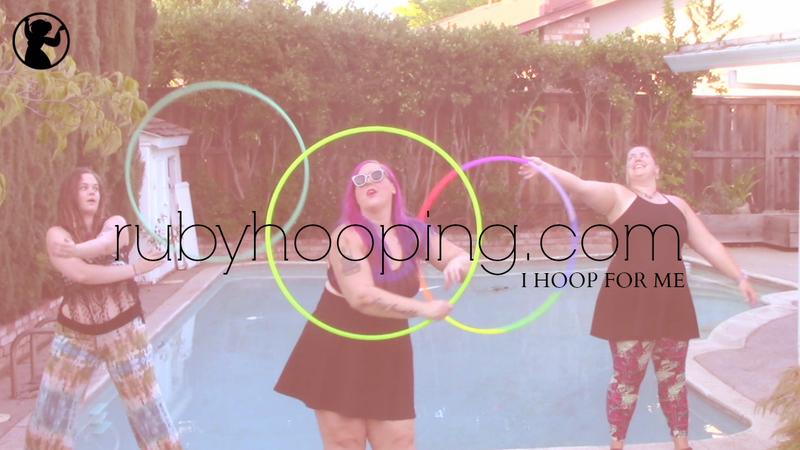 If you’re interested in all of the above, ideally you will want to start out with four hoops: a heavier beginner hoop to learn on-body hooping, a smaller hdpe hoop to learn off-body tricks and dancier styles, and a set of minis to explore doubles hooping. We put together a perfect set of these four integral hoops based on your waist size in our Go Getter set. Chances are, you’re going to become addicted to hula hooping and will be trying all kinds of different sizes and tubings. Nothing left to do now but start hooping! I’m interested in starting up hooping. I am about 5’3″ and roughly 108lbs. I cannot decide between a 38″ or something smaller. I know the bigger the easier to start with, but I’m kindof a small person so I’m not sure. Please let me know what you think, thanks! Hey Lana! It honestly depends on whether you are able to waist hoop at all yet. If so, go with a 36″. If not, you should probably get the 38″. You are going to want that extra space to slow the rotations down. It makes it easier to learn. I saw that you’re not doing orders right now but i was wanting to get one. i am a beginner, 5’9 about 206lbs. i’m hoping to get one that i can even get up. i couldn’t hula hoop as a kid. but it looks fun, and hopefully i can try to get some exercise out of it. what would you recommend for me? 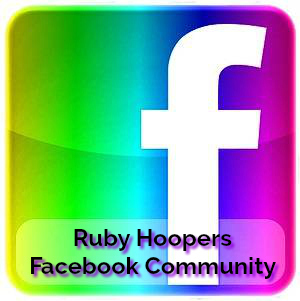 Hey ruby I was wondering how well would the budget hoop work for beginners? This was very helpfully that you very much, I’m look to try a different kind of workout and heard about hula hooping an though why not give it a go i haven’t done it in many many years i also wanted to know how long were your workout and how long before you started to see changes i also to have a tone tummy.it’s a work in progress for me at the moment i just want to do something different and fun so hooping sound great. Hey I recently bought a hoop that is 42″ and weighs 2 lbs… Is this the average weight or do I have what is considered a “weighted” hoop? Thanks! Your demos are very helpful! Yes, two pounds is definitely a weighted hoop. That is plenty of weight for exercising 🙂 You wouldn’t want to go heavier, as it could cause injury to internal organs. I’ve been hooping with a walmart hoop for about 4 months now and I hoop for the art and tricks. I feel it’s just not the right weight or size. I’m 5’2 and 105lbs. I do have some muscle built up but only for certain moves I know. I practice everyday in hope to advance. I need to know the size and hoop to get. 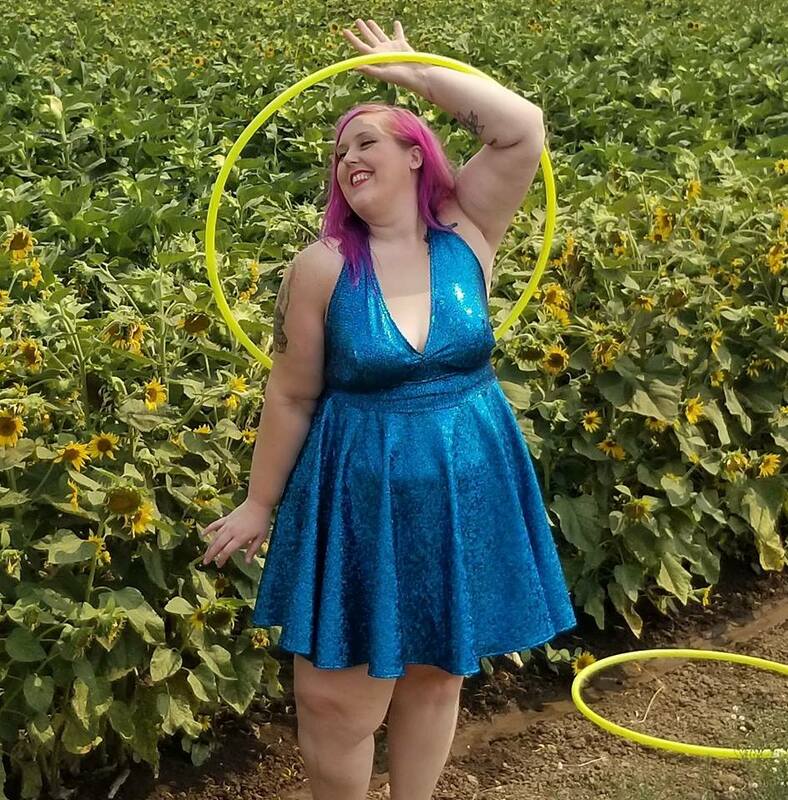 Hello, I am interested in what hoop I would need for being average body type and 5’3 ”. Ty. What size hoop would you recommend for a beginner that weighs 350lbs.? Hi I am interested in starting hooping but I have no idea what size to get I am 5’2 and weight 100 pounds? Thank you so much! For promptness and helpfulness! I’m looking for a hoop to buy, I’m 5’1″ and 195 lbs. what diameter hoop should I get? Also I’ve been waist hooping since I was little so I’ve got the hang of that but I want to start doing tricks so how does that factor into what hoop I should get? Thanks!! Hello i’ve been hula hooping for around a month to strengthen my core and can do 10mins per day with the weighted one but i feel like the hoop is too small as it doesn’t go up to my belly area. I’m 5’11 so I was wondering what size hoop you recommend? Thanks. I usually recommend a 38″ for “average size” adults. If you’re petite go for a 36″, if you’re curvier like me, go bigger! Hey, I am 5’6 and weigh about 135 lbs. I want to start hooping more for dance than weight loss or exercise. Any recommendations one which hoop I should purchase first and any brands/materials that work best for beginners? Hey Ruby, thank you for this handy guide! I’m actually trying to buy a hoop for a friend as a Christmas gift. However, he’s a very tall, slim gentleman. He’s 6’2″ with a 32″ waist. I’m not really sure what to do with that information. He’s so tall most of my math says to get him a larger diameter hoop, but the 32″ waist says veer smaller. Any advice would be greatly appreciated! Thank you! Hi, I’m 5’10, 143lbs, my waist inch is 28 or 29 inches. What size hoop would you recommend? Hi! I would recommend starting with a 36″ Beginner Hoop! Yes 38″ is the perfect size for you to start with Carrie! Have you looked at our beginner hoops? Ok Thank you. No not yet I will have to check them out. I would recommend a 36″! 🙂 I think I spoke to you via email, but I wanted to reply to this post for other readers as well. Hi, Ruby. I’m a beginner hooper at 5′, 115 lb and interested in core strengthening. 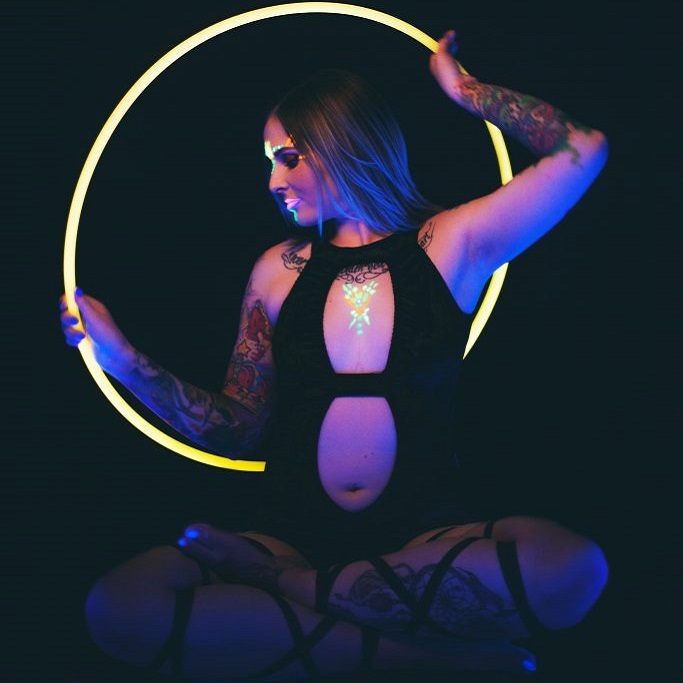 Since my waist is 35″ would you recommend the 38″ hoop or a larger one? Hi, I love your website, so informative. I could hoop really well as a child, I could even do a few tricks. So I thought it would be fun and a why to exercise…wrong, not fun, but I get plenty of exercise from pick up off the ground. Whew. I am 6 ft and 270 but extra hips and backside, and waist is about a 38″. I brought a 42″ weighted exercise hoop from Walmart. I am frustrated. But my spouse is 6’6 and a 34 waist is great at it. I mean if I get a 44″inch hoop does two inches really make that big of a deal? Or just keep pick it up and starting again. Maggie, you should be able to work with a 40″ hoop. 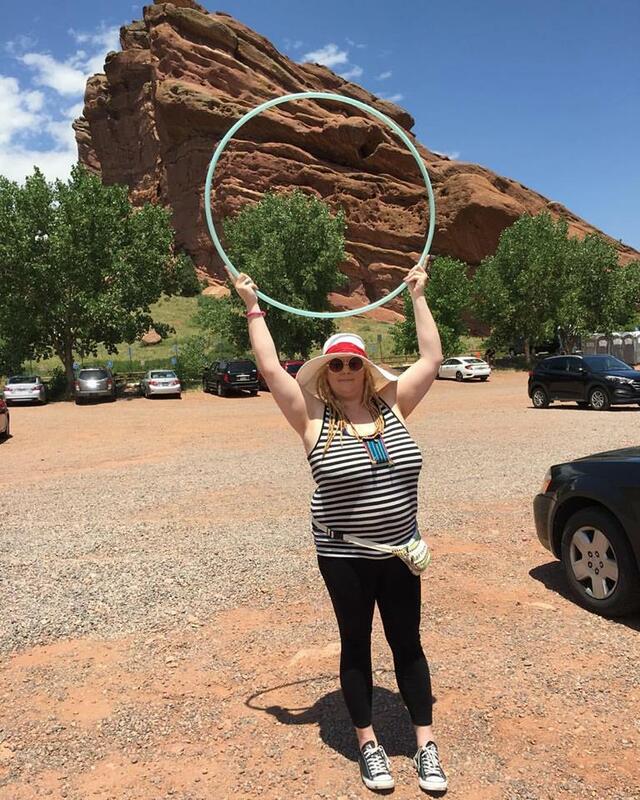 Bigger is definitely always better for beginners when it comes to hooping around your waist. For tricks and other dancy stuff, sometimes smaller is better. However, all hoopers need at least one large hoop in their collection. Happy Hooping! Make sure to check out our Shop next time you want to buy a hoop! I’m 5’7 and 390lbs. Love your website! I’d love to hoop and I’m gonna prove it’s possible for people my size. What size hoop would you recommend? Do you also ship to Europe? I’m 50 years old and I’m a beginner. Although I could hoop when I was a kid. Hello Kris, thank you for your comment. I would definitely recommend one of our larger hoops to start off with!! The bigger the better honestly! You can choose any beginner hoop and then choose the upsize my hoop option to get a 55″ diameter which I would definitely recommend for you! We absolutely do ship all over Europe and the world! Hi Ruby! 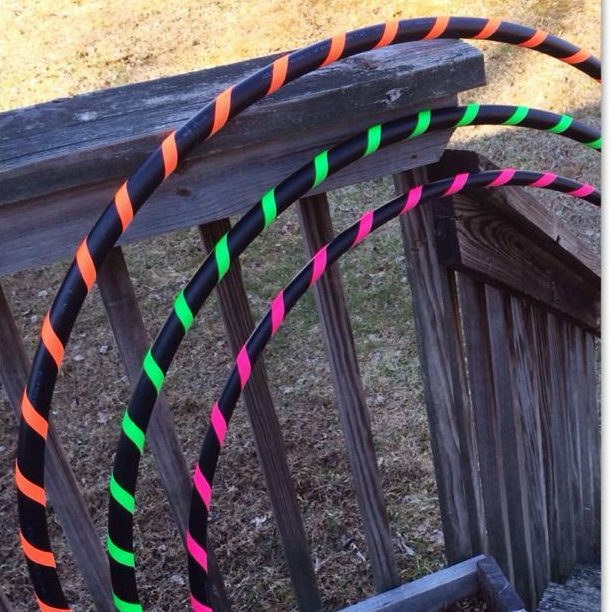 I’m trying to get into hooping and in your opinion for a 4’10, 85 pound gal who can’t even waist hoop yet (oops mediocre girl over here hehe) what size hoop should I be getting? I ultimately want to do on body and off body tricks. Mahalo from Hawaii! Hi! I’m 5’1.5” and around 97 lbs, with a 25” waist. I have no experience hooping. Do you think a 36” hoop is a good option or too small? I also hope it’s not too big to start with because I want to learn tricks. Thanks! Hi! I’m 5’4.5″, around 165lbs, with a 35″ waist. What size should I get? I have no experience and am in search for the perfect first hoop for me. I don’t know if it helps but I would love to learn both on and off body tricks. Thanks! Ahh thank you! also thank you so much for replying so fast. I will most definitely look into both links for sure! Great! You’re welcome. Let me know if you have more questions. Hello! I was wondering what type/size hula hoop would be best for me! I’m 5’10” and 120lbs. 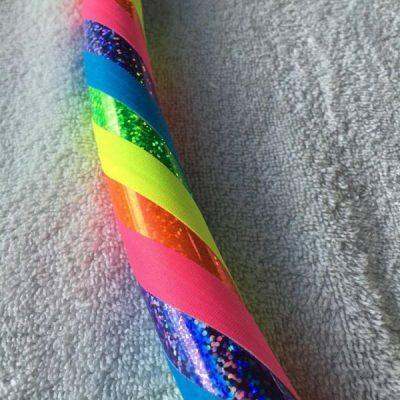 I already know how to hula hoop as well as a few tricks ( done with a cheaper hula hoop from a store, but it’s a bit heavy to do certain moves) I was hoping to learn some more tricks and find a hoop size that would be good for hooping both on and off the body. Thanks in advance! Hey Lindz!!! I would recommend a 36″ 3/4″ HDPE or polypro hoop 🙂 Perfect for both on and off body. I love your site! I used the links to buy the tubing to make a beginner hoops from PE. 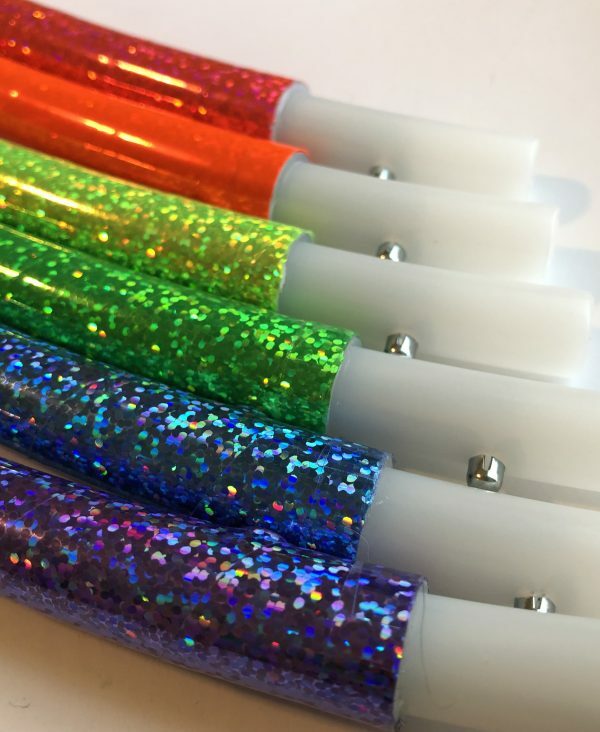 Now I want to order HDPE tubing so I can make some of that type. I’m having a hard time finding HDPE tubing. Do you have an online source or a hardware store you buy HDPE? I have 7 kids and they each want one and I can’t afford to buy them pre-made. Thanks!! Do you want white tubing or colored?